Coconut and cacao are two foods that offer incredible health benefits. These two saturated fats are not only plant-based (if that’s a concern), but they’re also high in antioxidants, minimally processed (most are raw), and they’re also incredibly satiating. These two butters come from the coconut plant and the cacao bean. They are two of the most antioxidant-rich options we have available to us that are cholesterol-free. So, while coconut oil and a dark chocolate bar are still smart choices, there’s more to these foods than meets the eye. The butters of cacao and coconut contain fibers, fats, and endorphin-boosting nutrients like enzymes, B vitamins, magnesium, and even protein! But their fats are the real game-changing ingredients that are so good for our mood, and ultimately our health. Coconut is high in medium-chain triglyceride fats that promote good brain health and a healthy metabolism. These fats are bypassed during digestion and metabolized by the liver, where they are used for detoxification purposes and for fuel. Not only is coconut butter generally easier to digest than dairy butter, it is also very satiating and phenomenal at curbing a sweet tooth, even though it contains no sugar. 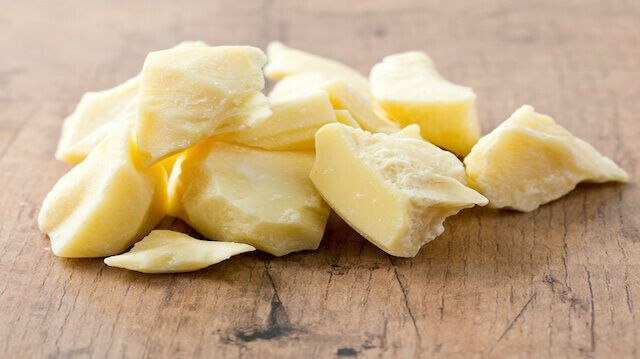 Cacao butter is the white part of the cacao plant that you might associate with white chocolate. Pure, raw cacao butter, however, contains no sugar and, unlike the dark part of the cocoa bean, is less bitter and more creamy in taste. Cacao butter is what gives a chocolate bar or a high quality cocoa that rich flavor. It is the ingredient that makes the best products stand out from the bunch. Cacao butter contains high amounts of antioxidants and protective nutrients, such as vitamin E, which make it so great for your skin. Although cacao butter is most commonly known for its benefits to the skin, its antioxidant content also nourishes the brain, protects the brain from disease, and also affects the way the brain functions. Some of the best ways to enjoy coconut butter and cacao are also the simplest. Spoon a little cacao butter or coconut butter into your next smoothie, or have a spoonful as a snack instead of peanut butter. Alternatively, blend up a dairy-free bulletproof coffee with one of the two butters for a rich, indulgent treat in the morning or early afternoon. Of course, you can also enjoy cacao or coconut butter in raw desserts, or melt them to make your own chocolates and coconut candies. Just be sure you’re mindful of portions and don’t use these as a replacement for healthy vegetables, greens, and protein, which you need for overall good health. And, be sure when you eat these delicious fats that you also occasionally include other beneficial fats in your diet — try monounsaturated fats such as those found in almonds, fish, walnuts, pecans, avocados and olives (or olive oil). Including a variety of fats in your diet is important for overall health and to give your body the variety it needs to thrive. Also, do your best to purchase healthy fats in a raw and organic form when possible, since heat during processing can destroy some of the nutrients and changes the fatty acid profile. We no longer have to avoid saturated fats like these — what are some ideas you have for adding them to meals and snacks? Previous articleAre Your Tampons Toxic? Hey Buddy!, I found this information for you: "Turbocharge Your Brain with 2 Healthy Fats". Here is the website link: https://www.thealternativedaily.com/healthy-fats/. Thank you.